Not so wordless today. These are the daughters of Francisco Pacheco and Alexandria de Caires. On the left Sophie (Pacheco) Figg. 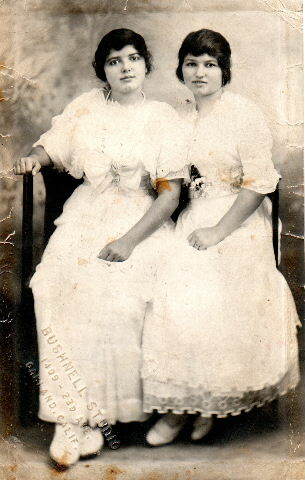 On the right, Maria (Pacheco) Homan/Buskirk. Sophie was married by 1915 and living in Hawaii with her husband, who was a soldier stationed there. So, I’m guessing this photo was taken around 1913-1914. The photo is somewhat of a mystery. Francisco and Alexandria didn’t more to California until after 1920. The photo is stamped Bushnell Studios, Oakland, CA. So, what were his daughters doing in California? Most likely they were visiting relatives in Oakland. I wonder if I can find a ship manifest with the two sisters on vacation?